Well here is one more quick card. A fellow at work did something really nice for my family over the holidays, so I needed a thank you card right away. I usually don't like doing one dimensional cards, but when time is a tickin', sometimes I have to give in. This paper had everything printed on it already except the little Thank You banner. I pulled out my Spellbinders die and cut a quick banner and then using Distress Inks, colored in the center of it before stamping Thank You (from Joy's Life Stamps) on it. I added a brad and a pearl and some Stickles and it was ready to go. To make up for two quick cards in a row, I'll be back tomorrow with TWO cards to show you. Deal? Deal. 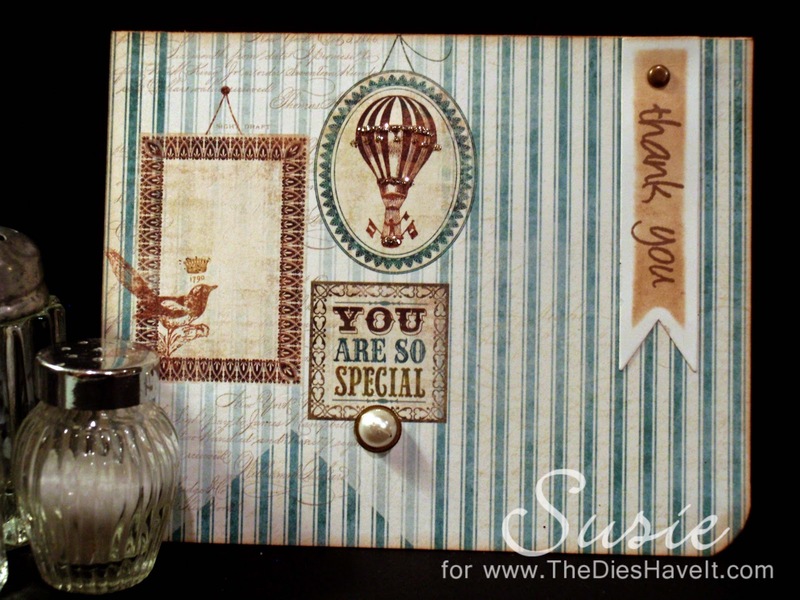 Wonderful masculine thank you card, there are a ton of wondeful details you added. Thank you so much for stopping by my blog.